Do you know a volunteer or team of volunteers at Far West LHD who you think do an exceptionally good job? Wish to recognise their efforts? 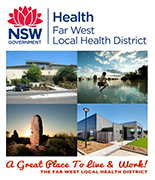 You can – nominations have opened for the 2019 Far West Local Health District and Pamela Lord OAM Volunteer of the Year Award. All of our volunteers do a fantastic job and contribute enormously to the health service and the wider community in their respective areas. We are extremely appreciative of their efforts and commitment and we urge everyone to consider nominating a volunteer and/or team of volunteer. You can download a nomination form HERE or contact Darriea Turley on 0429 848 480. Nominations close 10 May 2019 and the Far West LHD & Pamela Lord Volunteer of the Year will be announced on 25 May 2019 during National Volunteer Week, which runs from 20–26 May 2019. Interested in Volunteering with Far West Local Health District? The Far West Local Health District welcomes volunteer involvement across many of our services and departments. The Inclusion of volunteers in our Health Services across the district is an important part of our work in providing high quality service to our consumers and communities. If you are interested in joining our dedicated team of volunteers please access the information below in our Volunteer Handbook and Brochures.